Before we moved here, I spent a lot of time looking at Web sites about Paris. I did this partly to keep me motivated through the sometimes difficult visa process, but mostly to get ideas about what we would do and see (and eat of course) once we arrived. I’ll admit that I have an obsession with learning as much as I can about a place before traveling (or in this case, moving) there, an obsession that is not shared by my dear husband. Joe usually has ideas beforehand about what he’d like to see, but he is much more laid-back about it. He is perfectly happy to experience things as they come up, whereas I have a tendency to make grand lists of “must-sees” that can sometimes get in the way of having a relaxing vacation. This tendency of mine is one reason I’m so excited to be able to live in Paris, rather than just visiting. I can see all the things I want to see at a leisurely pace, and can even visit the Louvre as many times as I like! Knowing my weakness for overzealous planning, most of the time Joe is very amenable to letting me set the schedule of what we will see and do. On the negative side, there have been many times during our travels when my pre-planning has gone horribly awry, but there have also been many times of triumph in which I’ve led us to some place that Joe turned out to absolutely enjoy. One major example is the trip we took for my 30th birthday a few years ago; I was set on going to Patagonia, and even though Joe hadn’t ever given much thought to traveling in Argentina, I think he loved it at least as much as I did. More appropriate to our current situation, it was through my urging that we visited Paris the first time we were in France, and we know how that turned out! So last week, when we decided we would take a break from work and hiding out in our apartment, I once again determined the plan for the day. There were a bunch of places I wanted to visit that were all in the same neighborhood, the Marais district, and it made sense to check them all off the list at once. We’d start by taking the MÃ©tro to the St. Paul station in the 4th arrondissement, and go from there. I first wanted to visit a shop that sells absinthe and accessories for serving absinthe, called Vert d’Absinthe. Then, I wanted to walk by an American-style diner to see what it was like, before heading to a falafel restaurant I’d heard a lot about. After picking up our meal, we would walk over to the Place des Vosges to have a picnic on the grass. At our first stop, the absinthe shop, we had a great time browsing and tasting the wares. I’ll leave the details for Joe to write about in another post, but I’ll just say we left the store happier than when we went in, and only slightly worse for wear. The next place I wanted to visit was a restaurant called Breakfast in America that purported to serve real American-style breakfasts and diner food on their Web site. As we walked by, I liked what I saw, and thought I’d most likely be back once the craving for pancakes, waffles, or other hearty breakfast foods kicks in. 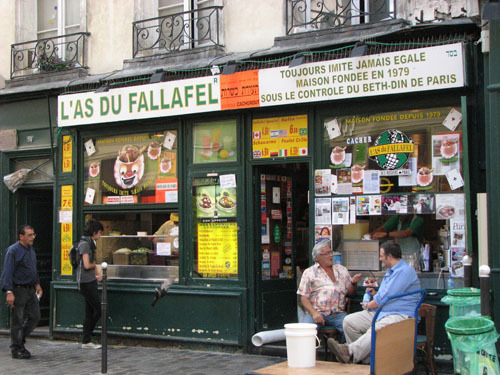 But still wanting to taste and experience new things, we continued on to L’As du Fallafel (their spelling of falafel) at 34, rue des Rosiers, to grab an early supper. There are numerous recommendations for L’As du Fallafel online and in guidebooks, and I was eager to see if the food would live up to the hype. I had eaten falafel at popular places in San Francisco and liked it immensely (for example, at Ali Baba’s Cave on Haight Street) and I wondered how L’As would measure up. I had one concern though; everyone recommended the falafel special, a sandwich that contained many items Joe usually won’t eat (tomatoes, eggplant, and onion) and I wondered if this would be another pre-planning fiasco. With all the glowing praise of the food to back me up, I decided to take the risk anyway. I had thought we would simply buy our sandwiches Ã emporter (for take-out), but when we got near the restaurant we were warmly, if a little forcefully, encouraged to enter the restaurant to eat. We knew it would likely be more expensive, but in our happy mood we didn’t mind the change in plans. The inside of the restaurant was fairly basic but pleasant, and we didn’t have to wait long before being served our falafel specials. The first thing I noticed as I was handed the heaping full sandwich was the smell and texture of the pita bread it was composed of. The bread seemed incredibly fresh and almost pillowy, and completely unlike most other pita bread I’ve eaten. I wasn’t disappointed by the contents of the pita either; balls of golden falafel, crisp cabbage, creamy eggplant, and a knockout tahini/hummous sauce made me want to eat it all in one gulp. I was especially struck by how light and fresh everything tasted, not greasy at all, which was surprising considering it did contain fried items. I was so busy enjoying my sandwich that I was shocked when I looked up to see that Joe had almost finished his. I couldn’t believe he had eaten the whole thing without taking out any offending items, and he even professed that it was probably the best falafel he had ever eaten. I had triumphed this time! He really liked it. When we left the restaurant we noted that we could have gotten our specials for â‚¬4.50 at the take-away counter, but we were happy with the â‚¬6.50 sandwiches we had eaten inside. We also noted that L’As is closed from Friday evening through Sunday morning in observance of the Jewish Sabbath, so we’d have to plan our return trips accordingly. And I know there will be plenty more of them. I’ve already decided that L’As would be a great place to take visiting friends and family, especially the vegetarians among them (our sandwiches were entirely veggie). With pleasantly full stomachs, we walked over to the Place des Vosges for a stroll around its arcades, and happened across the HÃ´tel de Sully on the way. This justly famous mansion now houses the offices of the Centre des Monuments Nationaux (Center for National Monuments) but it is also open to the public to view its gorgeous facade and courtyards. Heading back to the MÃ©tro, we made one last stop for a chocolate bonbon apiece before taking the train home. It was a lovely day, all the lovelier since we could do it again tomorrow if we wished!